A car bomb tore through a convoy Monday in central Baghdad, killing at least 13 people, including three foreigners working to rebuild Iraq's power plants. A crowd gathered, shouting "Down with the USA!" and dancing around a charred body. A second car bomb went off Monday near the town of Salman Pak southeast of Baghdad, killing four people and injuring four others. 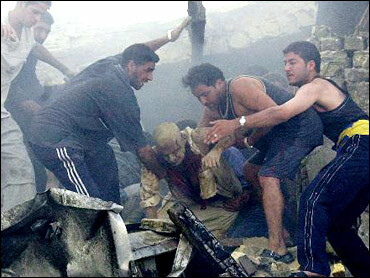 The Baghdad blast destroyed eight vehicles and turned nearby shops and a two-story house to rubble. Iraqi officials said the dead included five foreigners. Dozens were injured, including seven foreigners, the military said. The U.S. military said the bombing killed an American, two Britons, one Frenchman and another foreigner. Britain's Guardian newspaper reports the Red Cross has demanded that the U.S.-led coalition either charge Saddam Hussein with a crime, or let him go on June 30. Because the ousted Iraqi leader is a prisoner of war, international law dictates that once the occupation ends, he must be let go if he hasn't been charged with a crime. British voters angry over the Iraq war punished Tony Blair's Labor party at the polls in elections for local governments and the European parliament, costing the party hundreds of seats. Leaders of the Senate Intelligence Committee are accusing the CIA of trying to delay release of the panel's report that criticizes the agency for overestimating the prewar threat posed by Iraq. On Sunday, a U.S. Army OH-58 helicopter crashed near Taji, but the two-member crew survived "in good condition," the U.S. command said. The cause of the crash and whether it was related to the fighting was unclear, but the U.S. command said there was no indication the aircraft was shot down. As many as 1,400 detainees will either be released or transferred to Iraqi authorities by the June 30 handover of power, the U.S. military said Sunday. The Americans will continue to hold between 4,000 and 5,000 prisoners deemed a threat to the coalition, a U.S. official said. The U.S. command will also continue operating the Abu Ghraib prison, focus of the scandal over U.S. abuse of Iraqi prisoners, Lt. Col. Barry Johnson said. U.N. Secretary General Kofi Annan on Monday called on members of the world's largest Islamic organization to support the new Iraqi government that takes power next month. The bomb in Baghdad went off as three SUVs carrying the contractors were passing through Tahrir Square in the center of the city. Five other vehicles were also destroyed, as well as nearby shops and a two-story house. Iraqi civil defense Col. Qadri Abdul-Latif said at least 12 people were killed, many of them in the surrounding buildings. The attack unleashed fresh anger at the United States. As bystanders crammed bodies into pickup trucks to rush them to hospitals, a crowd gathered at the scene, shouting "Down with the USA!" and setting fire to an American flag. A group of about 20 young men danced around a charred body. American troops beat one man with a stick; but after trying in vain to restrain the crowd, the troops and police withdrew from the area. "We deplore this terrorist act and vow to bring these criminals to justice as soon as possible," Prime Minister Iyad Allawi said after the attack. Allawi said the foreign victims of the Baghdad bombing were helping to rebuild power plants, but did not identify them by nationality. There have been 17 car bombings and a near-daily string of other attacks in Iraq this month. On Sunday, 12 people were killed in a car bombing near a U.S. garrison in Baghdad, and gunmen assassinated another member of the new Iraqi government, an Education Ministry official. The violence, nearly two weeks before the formal end of the U.S.-led occupation, has stunned Iraq's new government, which had hoped to gain public support as the legitimate representatives of the Iraqi nation. Capt. Issam Ali, security officer at the Neurological Hospital, said three dead and 14 injured had been brought there, many with serious burns and lost limbs. Al-Kindi Hospital reported receiving 29 injured. American authorities had feared an escalation of violence in the run-up to the June 30 handover of sovereignty. But they hoped the recent establishment of a sovereign Iraqi government would drain support for the insurgency, allowing security to improve so that balloting for an elected administration can be held by the end of January. However, two members of the interim government have now been assassinated since its establishment on June 1. Kamal al-Jarah, 63, an Education Ministry official in charge of contacts with foreign governments and the United Nations, was fatally shot outside his home in Baghdad Sunday. He was killed a day after the deputy foreign minister, Bassam Salih Kubba, was gunned down while driving to work. Both attacks happened in predominantly Sunni Muslim neighborhoods. Two other top Iraqi officials — both with the police force — narrowly escaped death over the weekend. Allawi accused Jordanian-born terrorist Abu Musab al-Zarqawi of trying to disrupt the transfer of sovereignty. "Al-Zarqawi and his followers are earnestly working to prevent the success of this measure," he said. "I want our people to be patient this month against those forces which are trying to assault them, and I promise the people that we are going to get rid of them and victory will be ours to build the a free and decent Iraq life." In Washington, Secretary of State Colin Powell said U.S. forces would do "everything we can to "try to defeat these murderers." However, Powell told Fox News that, "it's hard to protect an entire government."